"Once upon a time she sat there drinking lemonade." I took this photograph the other day while running an errand. 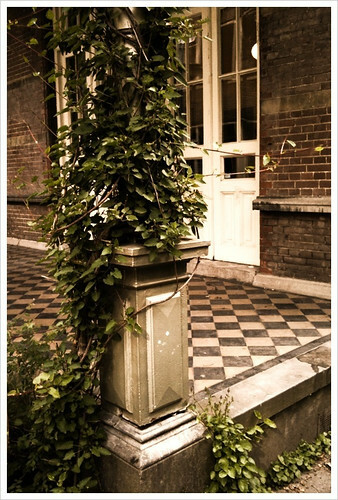 Something about that vine and the worn checkerboard veranda really called to me. I do love that I always have a camera with me now that I have an iPhone and I have a lot of fun with the filters in the CameraBag app. This one I ran through the "magazine" setting to give it that warm tone. I love living in a city filled with beautiful buildings. So much of North America is just so unabashedly ugly. Cheap to build, but it doesn't make your soul sing.